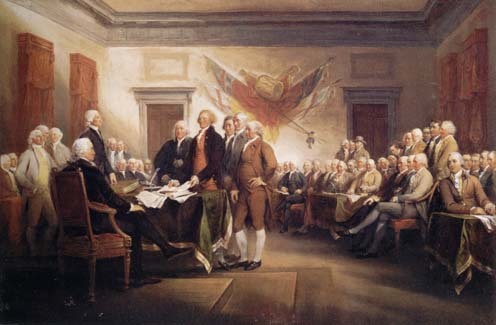 July 4th, 1776. More than a date on a calendar. It celebrates the boldness of an idea. It celebrates the boldness of a movement. It celebrates the boldness of free and independent men. Quite often during this time of year, we reflect on our Nation’s Founding Fathers and ponder their service and sacrifice….well maybe we used to. We might mention names like Washington, Adams, Jefferson, Franklin, Henry, Hamilton and many others in the American History Hall of Fame. Have you ever wished you could ask them what they think of us now? Have you ever wondered what advice they would give us in our present circumstances? What’s exciting, yet humbling, is that we have a glimpse of their advice to us. You see in the spring of 1777, almost a year after the formal signing of the Declaration of Independence and still over six years away from the Treaty of Paris that would end the Revolutionary War and recognize the sovereignty of our nation, John Adams penned a simple letter to his wife Abigail. In this letter, our future 2nd President sends us a message. Although short it is quite powerful. Here is his message to us. Posterity! (That’s us – future generations that he can never imagine – future Americans!) You will never know, how much it cost the present Generation to preserve your Freedom! I hope you will make a good Use of it. If you do not, I shall repent in Heaven, that I ever took half the Pains to preserve it. Read it again, it’s worth it. So what are we supposed to do with this Freedom? What does he mean by “make good use of it?” I believe we can do a few of things (among many) to make good use of this freedom. I believe we can strive to do what’s just, not what we can simply justify. I believe we can strive to do what’s responsible, not what’s permissible. And lastly, I think as we examine ourselves and the actions of those we elect, we can remember that these individual rights we enjoy assume an individual accountability…..to our fellow man and to our God. This entry was posted in Leadership, Misc, Sacrifice and tagged Founding Fathers, Freedom, John Adams, July 4th.